Chasing after each season’s most coveted ‘it’ bag is often an exciting, tricky venture~ you embark on a quest to secure yourself that handbag raved about by fashionistas across the globe and present in every fashion magazine. Though acquiring the latest it bag has its plusses, it's sometimes safer and easier to simply stick to the classics, investing in a piece already proven to withstand the test of time. Chanel has a knack for crafting timeless keepers, and one of my favorites is the half-moon timeless clutch. I'm often plagued by buyers regret, but not for this purchase! I love the shape, size, and versatility of the clutch. Ideally shaped (somewhat like a Chinese dumpling), it’s large enough to hold my everyday essentials, but small enough to fit comfortably in the palm of my hands. When considering versatility, the timeless clutch complements everything in my closet~ from jeans till cocktail dresses. With all these plusses, it’s just a matter of picking colors and leather: (lambskin, caviar, patent). Lambskin, thou softer and more feminine, scratches easily, and wouldn’t be suitable for everyday use. Patent leather’s young, fun, and durable, but smudges, and isn’t ideal for something I’ll constantly hold. With that in mind, I opted for a black, caviar, clutch with silver hardware. The clutch is the epitome of all things Chanel~ simple, classy, and versatile. However, lately, when I see Chanel, all that comes to mind are frequent price increases, so if your riding the fence, debating on whether or not you should get this bag, run to the store now before the next price increase. Chanel Timeless Clutch is really of fashion wear. It's size and shape are wonderful and looking more comfortable. Where did you get your timeless clutch? Is it still available in stores? what is the style #? Thank you. A is for fall in french, and 00V symbolizes a continuous line. Hi Elicia! When I bought it, it was $1900 plus tax from whichever state you purchase it from :) Let me know if you have any other questions! Hi Aileen! I purchased mine at a Chanel Boutique in Neiman Marcus. If I remember correctly, prices haven't increased yet, so it should still be $1,900 plus tax. Let me know if you have any other questions! Best of luck shopping! Hi Karen! Thanks for reading and following! ;) I would suggest this Chanel clutch! It's the clutch I use most, so it's definitely worth it. Mine says Italy! ps. happy shopping!!! let me know if you have any other questions! Absolutely gorgeous! I'm just wondering if you happen to know if the lambskin type clutch has a red interior and the caviar comes with black interior? Just like the classic flap bags? Thanks Nichole! Thank you!! Both the caviar and lambskin comes with a black interior! For the classic flap however, theres one with two layers, and that comes with a marroon/dark red interior, and the other, which is one layered, comes with a black interior! Hope this helps!! Hi there, thanks for the info but I went to Chanel Melbourne they said the clutch had been discontinue for a quite some time and was rude. I really like it...so is it really discontinue? Hi Isz! Apologies for the late reply. The timeless clutch is not discontinued here in the US. I just went to take a look the other day. There's a price increase from the original 1900 however. It's currently $2,400 as of August 2014. I'm sorry you had such a bad experience! You should come buy it in the US. Let me know if there's anything else I can do to help! 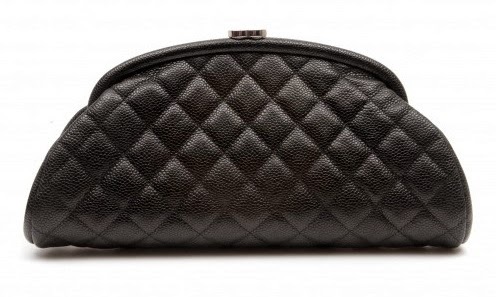 This is truly a timeless Chanel clutch that every modish lady would like to own. Nicole, please suggest me some good stores where I can enjoy good collection of clutches. Hi Chanel Clutch! You can purchase the clutch at any Chanel Boutique! However, I suggest going to Europe if you want a better price. Please feel free to email me your location and I can help you find a boutique. Hi there. In scouring the web to find out if the timeless clutch as been discontinued I found this. I know it's been years since you've posted this but do you know if it's discontinued? I'm hearing different things from different sales people...some saying it's discontinued while others are saying it's rare and only available in Europe. Thanks again!